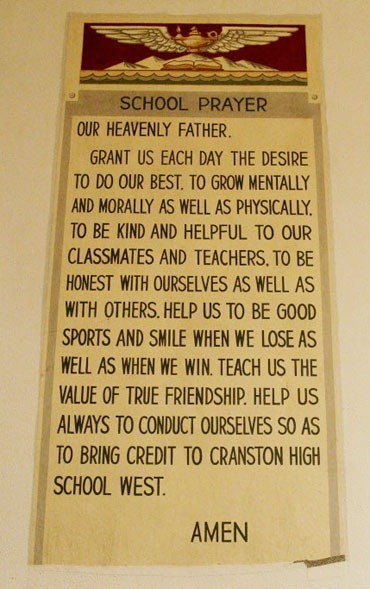 Jessica Ahlquist is a Cranston, Rhode Island teenager who objected to the display of a large Christian prayer banner on the auditorium wall of Cranston High School West. The display was illegal, according to the courts and laws of the United States. The Cranston school authorities refused to remove the banner, and Ahlquist, with the aid of the ACLU, sued. Ahlquist is an atheist. She won the suit and the banner was ordered removed. Throughout the process Ahlquist was subjected to the vilest verbal and written abuse imaginable, including death threats, from… wait for it… Christians. Apparently no suffering is too great to inflict on a teenage girl who insisted that her school obey the law of the land. Ahlquist required police protection in and out of school. The school system, in addition to the costs of defending the suit, is also being asked to pay $173,000 to the ACLU to cover their costs. The vileness of the Christian reaction beggars belief. Samples of the sort of threats and abuse can be found at various places on the Web, including the Military Religious Freedom Foundation, as well as many other places. Christians are not shy about threatening to kill people who disagree with them, who don’t believe as they do, who laugh at them. They are usually quite shy about identifying themselves when they make their threats. A sampling from the Freedom From Religion Foundation’s newspaper is enough to make decent people puke. But here’s what started the whole deal. Here’s the prayer. The prayer was written by a student in 1960, and was hung, as an eight-foot-tall banner, in the auditorium in 1963. Here’s the text of the prayer in case it’s not clear in the image. Grant us each day the desire to do our best. To grow mentally and morally as well as physically. To be kind and helpful to our classmates and teachers. To be honest with ourselves as well as with others. Help us to be good sports and smile when we lose as well as when we win. Teach us the value of true friendship. Help us always to conduct ourselves so as to bring credit to Cranston High School West. Obviously a prayer. Undoubtedly Christian, given the Christianism of the community. There are no accompanying prayers from Hindus, Jews, Muslims, Buddhists, animists, et al. Just this one. The judge, a Reagan appointee, a Christian, and a conservative, found that it violated the law and ordered it removed. But here’s the thing. The sentiments in the prayer are reasonable, the sorts of things students, and adults, might well aspire to. But the context, the frame, weakens the sentiments, as well as making the whole thing run afoul of established law. “School Prayer”. “Our Heavenly Father”. “Amen”. Desire to do our best. Seek to grow mentally and morally as well as physically. Work to be kind and helpful to our classmates and teachers. Desire to be honest with ourselves as well as with others. Want to be good in sports and smile when we lose as well as when we win. Seek the value of true friendship. Conduct ourselves so as to bring credit to Cranston High School West. That’s all they needed. No need to get on their knees and beg the invisible sky god for something that was already within their power as human beings. No need to insult people of non-Christian faiths. No need to cough up a couple of hundred grand in legal fees. But nope. Gotta dirty up their knees. Gotta act like weak little pussies who can’t handle the simplest things in life without begging the invisible hoo-ha to run their lives for them. Can’t think for themselves or make a decision about morals or values without bowing and scraping and begging the supernatural for help. Apparently Ahlquist is the only one of the whole crowd who has any balls and a mind of her own. And the upshot of it all? Vile attacks on the girl who pointed out the obvious and sought to correct a wrong. In fact, so disgusting and widespread were the perverted reactions of Rhode Islanders that a state Representative named Peter Palumbo, on radio station WPRO, called Ahlquist an “evil little thing”, and a pawn “being coerced by evil people…” A State Representative. A legislator. An upholder of the law. But oops, apparently also a Christian, and Christian perversion and bigotry and hatred trumps American law, doesn’t it? If their Christ ever existed, he’d be spinning in his tomb and puking up his guts over the actions of his followers these days. Want to see what a Rick Perry regime looks like, what a Rick Perry presidency would look like? It’s a wealthy theocrat’s dream, and a nightmare for sane people who have to live in the real world that Crazy Rick wants to create. The world got a look at 30,000 delusional Christians bowing before Rick Perry and John Hagee’s creepy bullcrap last Saturday, but not at the 90,000 people lining up a few miles away hoping to get free school supplies and food because good ol’ boy Christian Rick Perry cut four billion dollars from the education budget. Apparently Perry considered it more important to fund sonograms for women seeking abortions than in providing quality education to all the living, breathing children. Another sick puppy crawls out of Texas to seek the White House to house his vast ego, tiny heart, and cracked brain. Take a look here at Common Dreams and read the links.